Rebound has operated in the Italian market for over 20 years servicing it customer base of Aerospace, Medical and Industrial customers with PPV cost saving, Shortage and Obsolescence Management as well as offering Group Service including Custom Battery Packs, PCB’s and Value Engineering through over 50 Franchised and 300 Direct manufacturer relations. 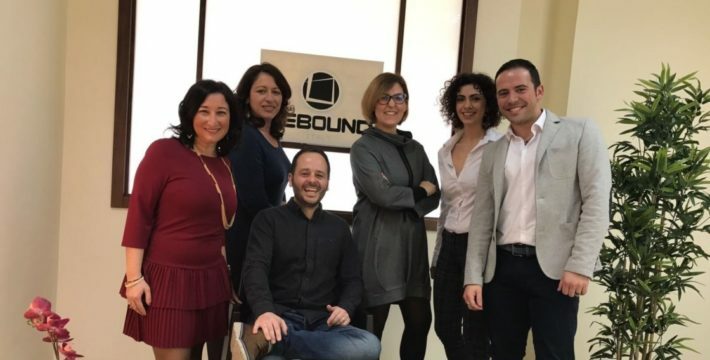 Stefan Mason with Regional Manager Marianna Pergamo and Sara Persichetti Senior Account Manager who boast over 10 years in the Industry working from Rebound as well as Business Development Executive Fabiana Giordano and Sales Administrator Margherita D’Ancora. Rebound will open an office in the Lombardy Region at the beginning of 2018 and is currently recruiting for Business Development positions that will begin in the UK at Rebound’s HQ in order to learn the business and adopt the culture of the group. Already having an impact is Business Development Executive Gianmarco Retta who joined Rebound at the beginning of the year with extensive International Trading experience including spells in Asia. Gianmarco was recently able to visit the Salerno office while fulfilling a same day delivery to an Italian customer who was in a line stop situation; delivering parts at 11,00 in the evening direct to the factory. His reputation asa trusted and dependable Account Manager continues to grow. We look forward to exciting times in the Italian market for Rebound and will continue to update the website with further developments.